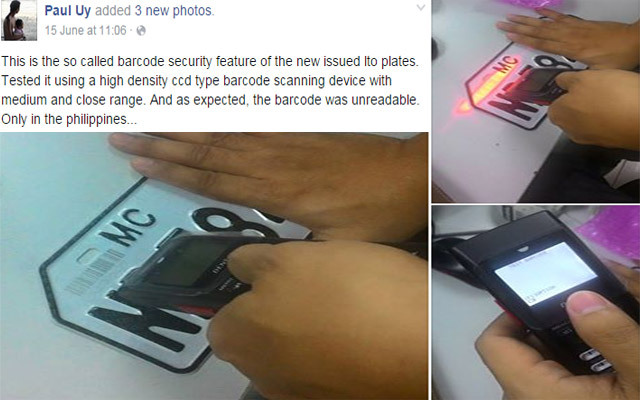 Legitimacy of Barcode on LTO Plates Questioned is it Scam?
. Contact him by email or follow him. It has been a while since the great uproar on the new license plates supplied by the Land Transportation Office (LTO). This new design goes with the Motor Vehicle License Plate Standardization Program. Not only the background painting and the material were modified but LTO boasts a high-tech feature on the license plates: a barcode. This bar code will allow traffic officials to easily get information such as the vehicle’s pate number, engine number, chassis number, third-plate sticker number and the serial number of the plate locks supposedly. However, Paul Uy, a man who got curious on the upgrade, tried to check on the barcode’s functionality by testing its security feature. On his Facebook page, he said that he used a high-density CCD-type (charge-coupled device) barcode scanning device with medium and close-range capabilities. As it turns out, the barcode was rendered unreadable. This got the eyes and ears of some people, after all, the barcode feature is one of the factors why the new plates cost much more expensive. This resulted to some discussions online including the choice of the barcode scanning device. One said that it might be readable using a long-range scanner when one is driving on the road or the highway. However, another person commented that A Code 128 barcode (the one used in the license plate) with such width is not used for long range. More people have caught on, calling the issued license plates as a scam from the LTO. A person, however, claimed that the LTO barcode is actually readable using a free barcode scanning application on a Samsung Galaxy Note 1. As to how the agency will handle the information or whether they even have a server is still a question.